One way to judge the quality of a company and its management is the manner in which they raise capital, and the cost of said capital. Management at semiconductor firm TranSwitch (TXCC) is earning itself no points for this week's announced capital raising effort. I call it an "effort" because it is truly a work in progress. They announced on Monday a commitment from Seaside 88 LP to purchase up to 1.95 million share in the company, which at then current prices would raise a little over $4million. 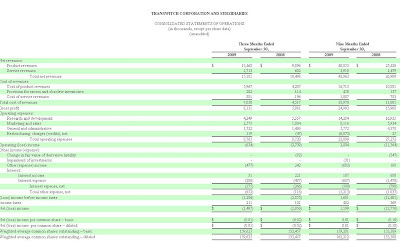 Sounds like a small amount to be sure, but Transwitch's market value is only about $35million, and they are not burning cash on a grand scale. I do see the need for financing however, so raising cash through an equity sale is not a bad idea. "Under the terms of the agreement, Seaside has committed to purchase up to 1,950,000 TranSwitch common shares. 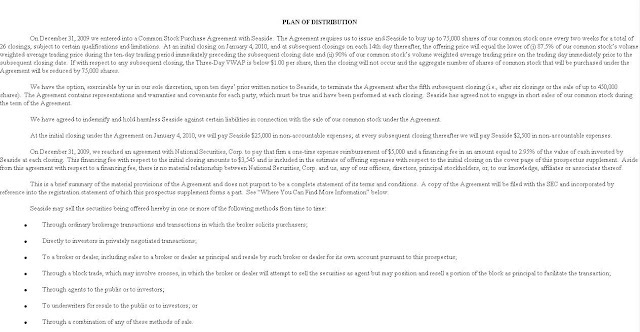 Seaside will purchase 75,000 shares every two weeks for up to 26 purchases. Today, TranSwitch and Seaside closed the first sale of 75,000 shares for gross proceeds of approximately $120,000." "At each subsequent closing, the price of the common stock to be sold will be an amount equal to the lower of (i) the VWAP for the ten consecutive trading days immediately prior to such closing multiplied by 0.875 and (ii) the VWAP for the trading day immediately prior to such closing multiplied by 0.90." Seaside 88 likely argued for this discount as a risk litigator given the small size of the company and the risk involved. But what a horrible signal to the rest of the market and existing shareholders, who must buy share at the market rate!!! It is unclear what the selling restrictions are on these share purchases. One investor suggested to me that Seaside wouldn't be able to turn around and sell for an immediate profit due to the small volume in TXCC stock, but that's likely not the case. With average daily volume of 50,000 shares traded, Seaside could bleed these back every day into the market and not account for more than 15% of total daily volume. What's more, their purchases are not made in the open market, so they don't drive up their own cost. There are additional broker fees involved in this transaction that make it even worse of a deal for the company. I admit that for an institutional investor, buying and then flipping 75,000 shares of a 1.80 stock every two weeks is by no means huge money. But this structure really sends a terrible message to other shareholders, and potential future shareholders, that they're second class citizens.